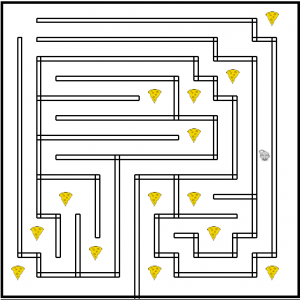 Maze 20 on mazecheese.com is another interactive maze game where you guide the mouse around to get the maximum pieces of cheese possible before the time runs out. The length of time (displayed as the red line in the bottom right corner,) is the same as Maze 19, but this maze is a little more challenging. Be careful not to go down the wrong path at first, or you will waste time backing out. A chime has been added every time a piece of cheese is gobbled up. The sound doesn’t work on every type of browser. It is not the ideal noise. Still searching for the right nibble noise. 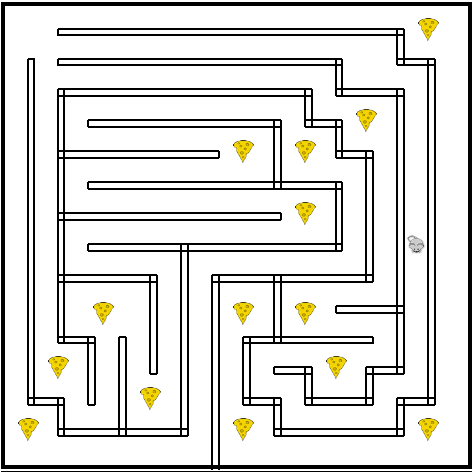 As with the other interactive mazes, this puzzle works on touchscreens as well as regular computers. The trick with the touch screen is to tap, slide and hold your finger/stylus to move faster and easier.